This is only a part of everything the youngsters took part in. Do you want to read more or see more of the event?It’s all covered, have a look here. Even with the more “serious” parts of the program being over, the theme of lacking opportunities to catch sleep continued onto the last official day, with a bus leaving the hotel early again (though at least not 4:20 again). 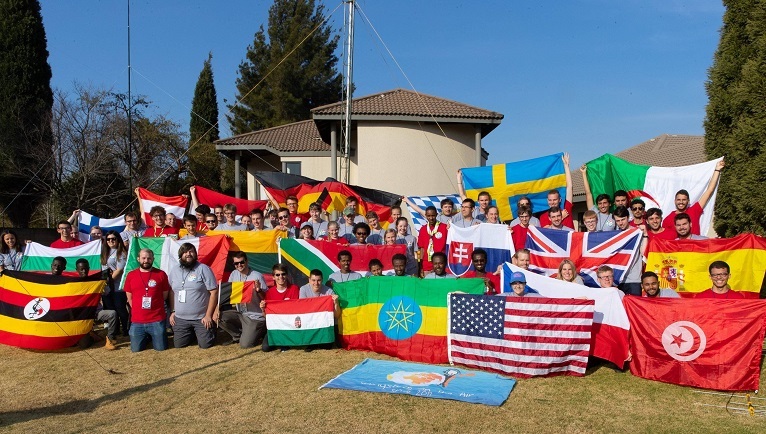 However, it was for a program point that, in this way, has not been possible on any of the European YOTA Camps before—a safari through the South African bush. With how packed the schedule was, this also meant a first chance to get the “Africa Feeling” for the European teams, or at least get to see (South) Africa as we all imagined. After arriving at the game lodge and splitting the participants among the available cars, we went off for a few hours, trying to see as many of the “Big Five”: Elephant, Lion, Buffalo, Rhino and Leopard. Success varied between the cars, but three of the five were seen by at least some—the ones that weren’t seen were the ones that could eat you for supper, so that maybe was for the best. Coming back to the lodge, we were greeted by a small group (flock? herd?) of kudus (a type of antelope) and some zebras, with some participants experiencing that the latter do not like people coming up close. While most people were busy photographing and/or petting the kudus, lunch was being made, so that’s what everybody went for afterwards. With people well fed, it was time to take the 2-hour drive back to the hotel, which provided a way for people to exchange their photos of the wildlife they had seen earlier (as well as some others); in keeping with the spirit of the hobby, this was of course done using SSTV via 2m FM. As most people used the opportunity to catch some sleep after coming back, the organisers found a great way of getting everybody awake again before dinner: a drumming activity, which consisted of everybody being supplied with a djembe drum, and then getting their hearts played out (and their hands played sore) together. After dinner, it was time for the last official event of the camp: The Farewell Event. This included handing out the HAREC certificates to the 20 of the 25 RAE participants that passed, many “Thank you”s from participants towards the organisers and everyone else involved in the event, and of course celebration until long in the night. And, unfortunately, first hugs and tears for participants that were going to leave already very early in the day. For everybody else, hugs and tears were reserved for the day following, with everyone getting back to the airport, after having found some way on how to get the reflector element for the satellite yagi back home. Overall, we sincerely thank the organisers and sponsors for an outstanding event, once again setting the bar high for future YOTA Camps to come. Even with such a busy schedule (busy enough these blog posts got delayed as much as they did), we would not have wanted to miss a single one of the program points. With all that said, all that is left is a heartfelt 73, and see everyone at one of the next YOTA events, whichever of the many it may be! Even with everybody still sleep deprived from the BACAR day, there wasn’t any time to catch up with sleep as the ambitious schedule continued on Sunday. In preparation for what was going to take most of the day, including the tea breaks, Hans Summer, G0UPL, presented the next kit from his company, QRP Labs, that was going to be built. We won’t spoil anything here until Hans’ official announcement, but all we can say is that it is an amazing product, definitely one-upping last year’s QCX kit. It might or might not be the case that some information about it has spread throughout other YOTA media channels, so it is definitely worthwhile to look through the posts there as well. However, when you try to beat a kit like the QCX, some people might be intimidated by the complexity; or they just want to build something that unexperienced kit builders can finish over the course of the camp. For this reason, Hans also brought other kits, namely his clock kit as well as the Ultimate3S WSPR kit, which builds upon the clock kit. For WSPR enthusiasts, you can be sure that there will be some rare WSPR DXCC(s) coming up rather soon! With the presentation out of the way, it was time to start actually building the kits. While there weren’t enough soldering irons to keep everyone soldering without interruption (anyone want to lend ca. 80 irons to the next YOTA event? 😃), this also meant that more experienced builders could help the inexperienced one, creating a great learning experience. Also, with all the soldering fumes in the air, it probably was for the better that we did not have more. At the same time, the lessons for the RAE (South African license exam) continued, an opportunity used by many to either upgrade their home license or take the exam in the first place, an opportunity not even offered in some of the countries participating. The afternoon of that day had two more presentations. One was about DMR, including a small, portable repeater; something you probably won’t see for analog modes. The other presentation was about contesting, presented by non other than three-times WRTC participant Chris Burger, ZS6EZ. Part of the presentation was also the YOTA tradition of an Off-Air contest, although with different rules than the participants were used to. Nevertheless, it was about as chaotic as the ones we knew from earlier years. After dinner, there was another Train the Trainer session, dedicated to trying to find each country’s challenges in getting and keeping youngsters interested in the hobby. With plenty of good ideas being exchanged, the official program ended rather late. However, apparently it was not late enough for quite a number of people to not continue their kit building until very late in the night. Monday was once again time for an excursion, this time visiting two local companies that supported this YOTA Summer Winter Camp in various ways. The first company was Bosco, which is the biggest PCB manufacturer in South-Africa. We had a tour of the entire factory, starting at checking the design of the produced boards to be, continuing through all process steps. It is interesting to see how many steps are involved in creating PCBs. After lunch, our schedule continued, with a presentation of which we only knew the name: “The Magnificient Bell at the Villa Griffone”. Hidden behind the mysterious name is not some spooky ghost story, but the history of radio, starting at the very basics, and then going on all the way through Marconi’s life, including live demonstrations of historic equipment. For everyone wondering about how Marconi was able to achieve a transatlantic transmission with the primitive means he had, the next talk showed why. With an increasing amount of electronic hardware and a race for cheaper devices, RF noise has increased by very sizeable amounts of Marconi’s time, to the point where his transmission would nowadays very likely be drowned out by noise. To quantify this increase of RF noise, an SARL project was presented to measure and quantify the RF noise surrounding all of us—not in perfectly scientific means, but still sufficient to actually measure the increase over time. To finish the presentations, an overview of the YOTA program was given. As avid readers of our site of course know, it does not only consist of the annual YOTA Summer Camp (or Winter, for a bunch of countries), but also the YOTA December Month, where Youngsters all around Region 1 (and more!) become active with YOTA callsigns, accumulating tens of thousands of QSOs over the month total. The third activity is the Youth Contesting Program, where youngsters get invited to so-called Big Gun contest stations, to experience the team effort that goes into getting to the very top of the scoreboard in various contests. With the presentations over and most people getting to relax (or rather mostly continuing on their kit), things got serious for some of the participants, as they were taking the RAE at this time. After dinner, it was time for the last session of Train the Trainer; this time with presentations about concrete action points that the teams intend to take in their home countries. With barely enough time to recover from the intercultural evening, the second day was kicked off with a presentation about South Africa, giving us an overview about this amazing country that we are barely able to witness otherwise, due to all the other activities planned! Next up was the BACAR payload building. The five teams that everyone was split into yesterday came together for planning the project, selecting the components, building the payload, and modifying the software to fit their needs. After lunch then came the first highlight of the payload building: The drop test. To ensure that all payloads survive the landing, each team had to drop their cube from several meters high onto hard ground. Fortunately, all team’s cubes survived that test, with only minor problems uncovered, which could fixed right after. With the drop test sorted out, it was time for the second, important test: The shake test. Attached to the end of a broomstick, the payloads were swung and shook around, ensuring that both the ropes attaching them and the cubes themselves survive the possibly very violent wind conditions that can occur during their journey. As it turned out, the biggest bottleneck uncovered during the test was the connection between the broomstick and the ropes, sending some cubes flying through the room. In the afternoon, we were given a presentation about South Africa’s first amateur radio satellite, Kletskous 1, including an explanation of both the transponder and stabilisation design. The current transponder prototype will also launch with the balloon on Sunday! To finish off the afternoon, there also was a presentation about how to actually work the satellites that are already out there circling our planet. To finish off Friday, we had another session of the “Train the Trainer” theme. This time, we were sent off rather early, to catch some sleep for the big day coming up. To start off the BACAR day, we all had to get up to 4AM, so we could arrive in Secunda around 6AM. When we arrived, it was literally freezing outside. When we were told before the camp that it was going to be 5 degrees outside at night, we definitely were thinking about +5! After some warm soup and the sun coming up, some people made final preparations for the payloads, while the rest watched the balloon being set up and filled with hydrogen. When the balloon was filled up and started wobbling around due to the strong winds, the payloads were already lined up, so the balloon could be attached and let go, speeding off and almost hitting bystanders with the long chain of payloads hanging off of it. Without losing time, we drove to the base station, the Secunda Radio Club clubhouse. From there, we tried to receive the signals from the various payloads, working through a list of exercises given beforehand. Even though some of the hardware on the balloon failed, there were still plenty of signals left to chase after with out antennas and radios. With the payload landed and the chase team still underway, we had some time to fill. Armed with the antenna from Thursday and the knowledge from Friday’s presentation, we took chase on the satellites that happened to come by. Those transponders sure were kept busy during that time. During the downtime, we were also given a practical demonstration of RaDAR – Rapid Deployment of Amateur Radio. Within a few minutes there were several antennas set up, and used for making QSOs with a portable rig. In the early afternoon, the chase cars came back, with the payloads in the trunk. This meant that the time for enjoying the sun was over, and we went back to work, trying to get the data collected during flight, as well as preparing the presentations for later. Unfortunately, it turned out that none of the teams had GPS data from the complete flight, and one even lost their complete flight data due to an unknown issue. It will be the first YOTA event which will focus on a train-the-trainer principle. In the week itself the participants will get tips&tricks to start own youth activities or youth programmes in their member society. With this, we will reach a bigger audience on national and local level, which makes it happen that more young people and newcomers can be involved in amateur radio.